They’ve been standing guard in our backyard since the house was built in 1997, but now I fear they’re beyond help. The two sentries, which stand about 30 feet apart and offer bountiful shade to our deck, are seriously ill with an undiagnosed disease. 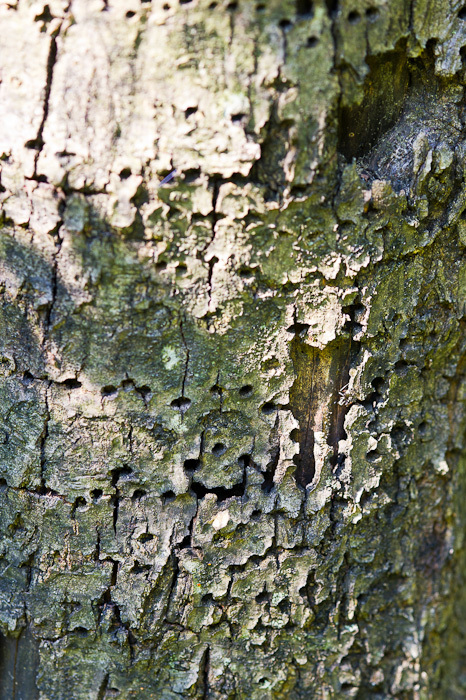 After spending time on the telephone today with our friendly County Extension Agent, I went out and took a series of photographs of their bark, leaves and branches to email over to them. Although we noticed last year that they didn’t develop their typical lushness over the summer, we chalked it up to a drier than average season. This spring, however, it became obvious that there’s something more going on, as their crowns are bare, and some of the bark on the trunk resembles swiss cheese. I hope to have an answer later this week, but in the meantime I’ve learned a valuable lesson—it’s a good idea to check on your trees regularly, to observe any changes in appearance and watch for pest damage because otherwise you might not realize an old friend is in grave danger.